Having visited Brazil, I can only describe it as a feeling. It is difficult to explain. Or recreate. The colours, the music, the elaborate carnival headdresses, the climate, the abundance of nature... stunning beaches, growing centres of culture and christened by early sailors the 'Land of Parrots'. It feels new and yet primal. You just need to go - then you can attempt to choose the superlatives instead. The world's fifth largest country by area and population it is best known for it's vast tropical rainforest and the Amazon river. Among the extensive wildlife - there are 200 endemic birds - the greatest number of any country in the world. One of the defining symbols of Brazil is the Samba, with it's roots in Africa - it is recognised worldwide as a mark of Brazilian identity and particularly it's carnival in Rio de Janiero. 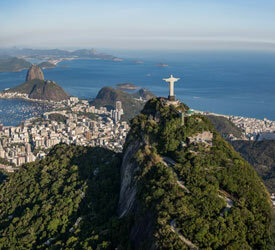 Chances are when you picture Rio de Janiero, you will see Christ the Redeemer - the colossal Art Deco statue of Jesus Christ - opening its 28 metre wide arms to you, standing a-top the Corcorado mountain. 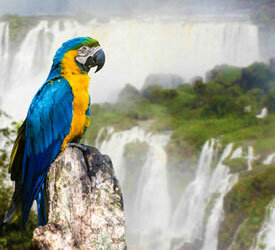 It is also home to the Iguazu falls, at the point Brazil meets Argentina - one of the New Seven Wonders of Nature. Watching the Iguazu river spill over the towering Parana Plateau into 275 separate waterfalls is a must for any visit to Brazil. Lady Eleanor Roosevelt is reported to have exclaimed "Poor Niagara!" on seeing them for the first time. Then, of course, there is the tribal adoration of it's local sporting heroes. Football is almost a religious experience here - none more so than at the Maracana stadium, where Pele scored the 1,000th goal of his career in front of over 65,000 spectators. And then there is the Grand Prix. This takes us to Sa Paulo; a huge, urban city - home to an estimated 20 million people. A city on the up, with residents slowly moving out of the favelas. 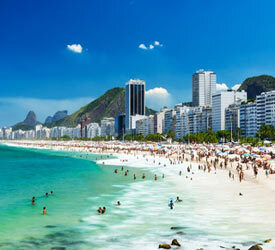 Cultural centres, experimental theatre, the best nightlife in the country and the home of Brazil's luxury brands. Sa Paulo is exciting, vibrant and increasingly multi-cultural. The Senna Foundation - set up after the death of it's famous son and Formula One sensation Ayrton Senna - subsidises under-privileged children here in the city. Named after Formula One driver Jose Carlos Pace following his death in a plane crash at 32 in 1977. He was born in Sa Paulo and a winner here in 1975. In 1926 a huge plot of land was bought by property developers. Following the market crash in 1929, it was decided to build a racing circuit instead. Between 1936-1940 it was built in Interlagos, Socorro, Sa Paulo. Sa Paulo grew at an incredible speed and soon the track was surrounded by houses. It was a design based on New York's Roosevelt Field Raceway. Interlagos (literal translation 'between lakes') is a region built between two artificial lakes (built in the early 20th century to supply the city with water and electric power). In the 1970s, following the international success of Emerson Fittipaldi - Brazilians wanted their own Grand Prix. Fittipaldi had won his first championship at Watkins Glen in the US in 1970 and so Sa Paulo officials started refurbishing Interlagos to modern standards. The first Grand Prix took place in Interlagos in 1973 and was won, quite fittingly, by Fittipaldi. In it's infancy the track was a lucky charm for local racers. Fittipaldi (1973,1974,1976) and Carlos Pace (1975) winning here in the 1970s. 5 Brazilian drivers have won here: Emerson Fittipaldi, Nelson Piquet, Ayrton Senna, Felippe Massa and Jose Carlos Pace. Alain Prost holds the record with 6 wins. Carlos Reutemann and Michael Schumacher both won 4 times. Drivers complained about the very rough and bumpy surface - which on occasion caused mechanical problems with the cars. Most of the ground-effect cars of 1980 were designed in such a way that bumpy surfaces were almost intolerable. Barriers were also not adequate enough for Formula One. Add deep ditches and embankments to this and you have a very dangerous track. 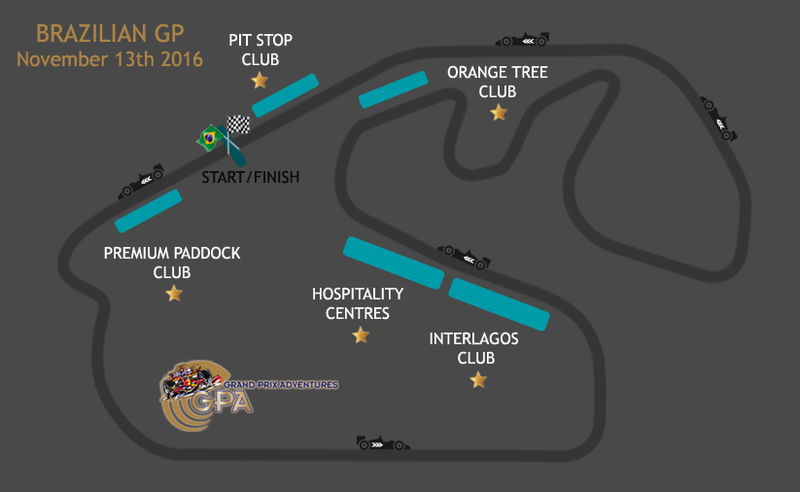 So in 1978 the Grand Prix moved to Rio to the Jacarepagna circuit. Though this was not without its own issues; it was flat, with extremely demanding corners long and fast - some of which were slightly banked. Jacarepagna, also had an abrasive surface. 1979 brought the race back to Interlagos. Defending World Champion Jody Scheckter, among other drivers, almost prevented the race going ahead in Interlagos in 1980 with their safety protests. By 1981 it was back in Rio. The slums surrounding the track in Interlagos were not projecting the glamourous image that Formula One were keen to portray and so the race stayed in Rio until 1989. During this time Alain Prost the "King of Rio" won here an astounding 5 times. Again the success of one of it's own Paulistas (residents of Sa Paulo) prompted a 15 million dollar redevelopment programme. As had happened with the rise of Emerson Fittipaldi in the early 1970s - a desire to return the Grand Prix to Interlagos was agreed in Ayrton Senna's heyday. The track was shortened, smoothed over, notably improved. So in 1990 there was a return to Interlagos, where Prost won his 40th career race (a record at the time). In 1991 Senna won in astonishing style - his McLaren manual gearbox was losing gears quickly and towards the end he only had 6th gear left - making the car extremely difficult to drive. After the race his exhaustion was so high that he had to be physically removed from his car. With 71 laps, some very challenging corners, elevation changes, a rough, hilly surface there is little room for error. It is difficult to overtake. There are a series of turns - left and right - different shapes, angles, lengths and inclinations. As the track runs anti-clockwise, at high altitude, it is tough on engines. The centrifugal forces can also be tough on the driver's necks. High temperatures and humidity while attempting to negotiate this track often leave drivers exhausted. The Lap record in Interlagos: 1:11.473 Juan Pablo Montoya in 2004. 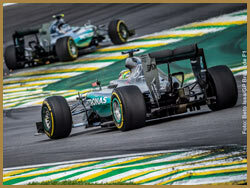 In 2015 Nico Rosberg beat Lewis Hamilton at Interlagos after controlling the race from the first corner. Hamilton had looked faster but was unable to get close enough to try and pass. He had already won the world title 2 races ago. For nearly 10 laps he was within a second of Rosberg. Mercedes had to change their tyre strategy from 2 to 3 pit stops as tyre degradation was more severe than expected. Max Verstappen was already showing promise - according to one BBC F1 analyst "I have compared him to Schumacher and Senna....at this stage of his career he is that good". 2016: Verstappen has since won the Spanish Grand Prix this season and crashed out in Monaco - what can we expect from him for the rest of the year? Hamilton and Rosberg are battling away nicely. Red Bull and Force India are beginning to challenge Mercedes.